I am convinced that it is a much better thing to know someone is dying than for it to be a surprise — though I’m less sure that this is the case in the first person rather than the second or third. My Grandfather’s decreasing health was a familial reality for a number of years, and at one point he and my Aunt decided that it was time for him to move from his small apartment in Michigan to live with her in North Carolina. Supported by an understanding workplace and her own angelic character, she was able to care for him in for the last years of his life in a manner saturated with serenity, dignity, and love. As we knew the end was drawing near, my Dad and I planned to go and visit him. My Dad was himself recently out of the dramatic hospital stay that inspired Another American Childhood, so it felt like an appropriate time to go on such a visit, wreathed in a feeling of uncertainty regarding anyone’s health and the wobbliness of the days and hours stretched in front of us. We stayed a few days. My Grandfather was comfortably supported with medication and a group of friends who had encircled him during his time in Raleigh. It was March of 2011. He primarily sat in a recliner in my Aunt’s living room, dozing in and out and chatting with us when he was awake. I started writing this poem during one of his naps. We flew in on Friday and back out again early Sunday morning. I can still hear him saying goodbye as I closed the door behind me the morning we left, before dawn, to catch the plane back home. “Goodbye, Rog.” As his name, my Dad’s name, and my name are all Roger, I don’t know if he was saying goodbye to me or my Dad specifically, but I did know it would be the last time I would hear him say our name, and the thought of it left me unable to reply. A couple of days later, he joined my Grandmother in whatever it is that comes next. Because it happened so quickly after our departure, it became easy to interpret the timing of his passing in a way that suggested he had waited for our visit, either holding on tighter to the rope of life in the days that lead up to it or letting it slip between his fingers shortly after. It is a compelling thought and one that is, selfishly, emotionally appealing. Regardless of its truthfulness, it was an utter relief that we were able to see him one last time; such an amazing, peaceful relief. I’ll never forget it. Before our first child was born in June 2011, my wife and I decided to go on one last travel adventure. Spending the holidays in the Galapagos Islands was one the best memories I’ve had in my 36 years. There is nothing quite like sitting on the beach next to sea lions celebrating Christmas. During our trip, we also had the good fortune to visit the Ecuadorian capital of Quito. What most people don’t know about Quito is that it is the second highest capital city in the world. To put it in perspective, Kathmandu, Nepal, is at an elevation of 4,865 ft., while Quito is at 9,350 ft. The crown jewel of Quito is the Basílica del Voto Nacional, which is the largest neogothic basilica in the Americas. It was very hard to get a photo of the church as the entire city is covered in clouds. Fortunately, just as I was leaving, the clouds opened up and I was able to snap this photo. Tina and I started dating in 1991 (on July 20th, to be overly specific). At the time, her maternal grandfather was battling stomach cancer. His suffering was evident the first time I met him. That October, on Sweetest Day, we went to the movies; I think it was “The Fisher King,” a movie I remember literally nothing about. When we came home, we learned — in those days before cell phones — that her grandfather had moved on while we were out. As she melted against the wall of the laundry room in anguish, a chill ran through me. She should have been at home that night. Her grandparents had come to Detroit from Sicily in the early 1950s and were, as is the case is many Italian families, the sturdy foundation upon which their entire family was stacked. A few years earlier, her Uncle had died far too young from cancer as well. These two events drew an indelible line across their family map and the disease has colored every doctor’s visit and annual checkup since then. I wrote this poem in the months after his passing. One of the tangible things he had left his family was the tradition of making palm crosses. Tina and I had to figure out how to make them by gently unraveling one of his and then refolding it. I’ve seen these before and never thought I had the dexterity for it. Delicate manual projects usually crumble under my frustration. Out of curiosity I checked Google for videos on making palm crosses. There are many, so I watched and I thought, if I screw this up, maybe Andy will have some better ideas. So being a good Catholic still in possession of last Easter’s palms, I gave it a try. (Note: this is easier if they aren’t so dry.) In shock at my successful failure to destroy a dry palm, I set up the shot on a satin pillow case cover, freshly unfolded from the linen closet. With a little help from Andy on post processing, we decided to use it. Over a year ago, the day after Christmas 2010 — my son’s thirteenth birthday — my Dad called 911 because he was having an extremely hard time breathing. It was late morning as best we can figure; to emphasize the drama, he happened to be home by himself. I received a call just before we were about to have some cake that evening that he was “missing.” His car was home. His cell phone was on the table. His shoes were near the door. A scary two hours later, we caught up with him in the emergency room, maybe eight hours after he had made his call for help. If we are connected on Facebook or you follow my other blog, I probably shouldn’t repeat myself. Let’s just say it was the start of a terrible month. I began writing “From All Anxiety” on January 1st, a few days later, after he had been transported to the University of Michigan’s CICU, which had very literally saved his life a few years before. The hours in a hospital are rarely pleasant — something ominous lurks behind every door, every tone, every loudspeaker crackle — but they are even worse when your patient is in an extremely serious place, unable to communicate with you, and the path forward is uncertain. Eventually, sitting in the uncomfortable visitor’s chair next to his window overlooking the helipad and, a bit further on, the Huron River, it felt like it was time to write something down, if only to preserve my fragile sanity, and as the writing went on I had the idea that it was also time to pull this collection together. The Detroit image that Andy captured always felt like a natural companion to this poem. My dad grew up in Detroit and I did just outside it. I worked in the Renaissance Center for a few years and always admired its broad-shouldered stance on the river and the views it gave us of the city. And the emergency life preserver, tucked into its strange yellow cabinet, was just what we had been looking for. As a child, Windsor, Ontario, only existed for me as the first of many cities on the way to family vacations in Niagara Falls, Toronto or Montreal. When I turned 19, it become a legal speakeasy where my college buddies and I would spend Saturday afternoons drinking beer and watching football. In my adult years, the visits to Windsor stopped as the family road trips were no more and I had turned 21. One beautiful Sunday afternoon in the fall of 2009, my wife and I were trying to decide how to spend the day and settled on a day trip to Windsor. I had not visited in over 10 years, so I was not sure what to expect but I was pleasantly surprised to find a very clean and family friendly community. After having a wonderful meal at one of the city’s many unique restaurants we walked along the boardwalk watching the sun set over Detroit. I was amazed at how beautiful the city appeared from across the river and I wanted to capture that moment to offset all the negative articles I read about Detroit with the collapse of GM three months earlier. Poems laid out on the page are liars. on both sides of their equations. I remember that I was in Florida waiting in the airport to fly home after a business trip; the original has the impatience so characteristic of air travel, but I think I like the edit better. My wife’s favorite vacation destination is Hawaii and, to be more specific, Maui. For those that have not visited this beautiful island, two volcanic mountains dominate the topography. 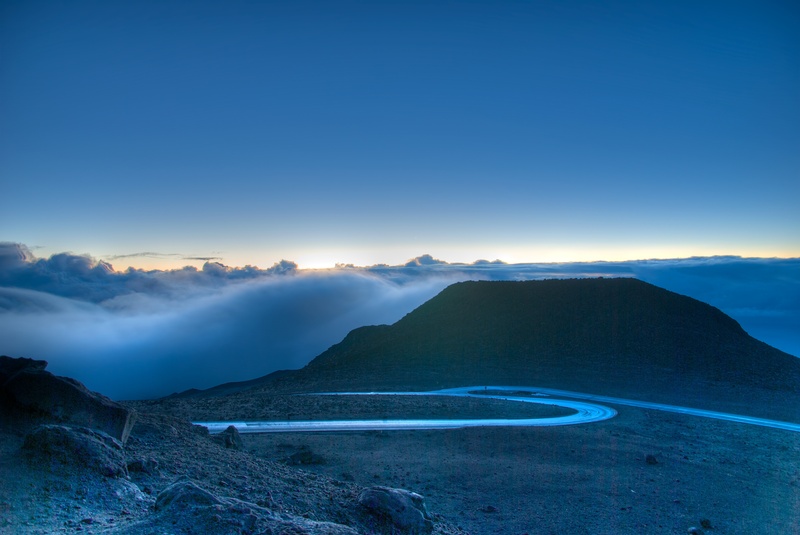 One of the mountains, Haleakalā, is a US national park and most vacationers to Maui visit it during their stay. On my first visit to Maui, my wife was very excited to take me to the summit of Haleakalā so that I could experience the breathtaking views. I was also excited — until she explained that the best time to visit was at sunrise and that the summit was a three hour drive from our hotel. Being the devoted husband that I am, I agreed to get up at 2:30am so we could experience sunrise at Haleakalā together. The next morning, I found myself standing at the summit in freezing temperatures just before 6am. As the sun was about to rise, a cloud settled over the mountain and I was barely able to see 10 feet. But I could see the disappointment in my wife’s eyes, and I immediately committed to the 6 hour journey again the next morning. We ended up with a perfectly clear day. Was it worth the 12 hours of driving? Absolutely! This photo is from our second ascent of Haleakalā and was taken from the highest point on the volcano, Red Hill. In the background you can see the lower Magnetic Peak, so named as it has large quantities of iron that interfere with compass readings. The first thing I realized after reading this photobiography is that all the photos are liars, too. I don’t recall if it was Birkerts or parenthood, but eventually I realized that not only was I never going to read all these books — many of them didn’t even seem particularly interesting any longer, perhaps because they had stared me down with their patient but demanding gaze for so many years — but that owning them was turning into a physical, and even partially psychological, burden. As I’ve previously mentioned, The Village at Grand Traverse Commons is an amazing restoration of a majestic building that had fallen into disrepair. One Saturday afternoon during the fall, my wife and I were fortunate enough to get a complete tour of Building 50 from Ray Minervini of the Minervini Group. Ray was very generous with his time and we were shown every nook and cranny, from the top of the red spires to the haunting tunnels. As a resident of Building 50, I had only seen the completed areas of the complex, but during our tour Ray offered to take us back in time to show us how the building had looked prior to restoration. This photo of the North Wing of Building 50 was taken in November 2010 shortly before being reclaimed and restored. The first house Tina and I bought was a 1920 bungalow on an acre lot with a falling-down horse barn and more work to be done to it than a dedicated team could complete in a year. Aside from refinishing or painting or repairing every square inch of the house itself, we worked on the yard exhaustively as well. This was before we had children, when we had more time and energy for such pursuits, a romantic This Old House phase that we are happy to have moved past, at least until we retire. In addition to house renovations, I became obsessed with horticulture and landscaping. Roger Swain was my oddly lovable, red-suspendered friend and Martha Stewart, when she wasn’t in the kitchen, his more elegant muse-companion. I read gardening magazines voraciously, dog-eared plant catalogues all winter with overly ambitious plans for the spring, and studied the classics of Gertrude Jekyll in an attempt to understand this strange world of form, texture, and bloom. Fortunately, I outgrew this phase, too. “Whisper, Love” was written just before we moved out of the house, over the winter before we learned that we were expecting our first son and decided to find a home located on a quieter street with less work to (still) be done. I remember writing it in pencil in an unlined notebook as the snow fell just outside the wavy glass windows that needed to be replaced but never were. My Dad is the closet gardener in my family. I never realized it before, never thinking about where the rose bushes came from. He doesn’t talk about it — except with my wife, the other foliage fiend — just quietly plants and tends to them, I think, somewhat for my mom, because her mom loved roses, and so does she. This was shot early one morning as I was leaving after a visit to their home in Brookfield, WI, as the sun was coming up at an angle that lit up this one rose. Glad we could use it on what is probably my favorite poem in the book. There was a beautiful little home design shop in Rochester called Bellissima that Tina and I would often shop in while walking the town. Right at the corner of Third and Main, it was next to the Coffee Beanery, which was more or less the best coffee available in town before Starbucks moved in — and then out again — and their proximity made a coffee and a stroll through Bellissima a pretty routine outing for us. We bought a few lamps there, which only recently made their way into someone else’s hands via a tag sale (as Martha Stewart would call it), and assorted other knickknacks of life. But there was one opportunity we missed. As it turns out, the narrative of the poem is very realistic. We loved a painting in the store called “The Ochre Chair,” an interior with a prominent chair and its interesting ochre color. It was priced in a range that was affordable yet not something that you would pick up on a whim. We waited and waited to see how fate would resolve the tension for us. Would it be purchased by someone else? Would we find an extra balance in our account at the end of one month or another? Or would we decide that, in the end, we didn’t like it enough to acquire it? None of these more obvious omens materialized. Finally, we wore ourselves down when we decided precisely where it should go in our house and we walked into town to buy it. Inside the store, the painting seemed suddenly more beautiful because it was finally going to be ours — and by some miracle they were having a sale. As anticipation is more satisfying than realization, we chose to intensify the retail pleasure by elongating it, walking through the store to see what else might interest us and even going to their small upstairs loft where linens and bath items were extravagantly displayed. ELAINE: Well, I mean, he was in the apartment, and then it’s gone and it’s in your apartment. RAVA: Maybe you think we’re in cahoots. ELAINE: No, no. But it is quite a coincidence. RAVA: Yes, that’s all: a coincidence! ELAINE: No, that’s a big coincidence. RAVA: That’s what a coincidence is! There are no small coincidences and big coincidences! RAVA: No, there are only coincidences! Ask anyone! RAVA: Are there big coincidences and small coincidences, or just coincidences? Well?! Well?! I’m not sure where I land on the question of the measurements of coincidences, but I have to say when Tina and I came down the stairs of Bellissima, on the corner of Third and Main, in this little store and town we loved, filled with joy about a painting we had thought about for a long time, we were more than surprised to see that the wall on which it had hung was empty. Outside, a woman was placing a large parcel into her trunk. We turned to the clerk in despair. Fate had decided. To start with, yes, I had to look up ochre. Who calls a color ochre? Driving home one night I saw the furniture store on US-31 and made a mental note to drive back by after dark when the lights would play up the inside. So 11pm, after a Burger King run, I drove in and shot this, and a few others. But the words on the door “Sunday – Closed to be with family” in this one resonated with the group. There’s probably some ochre in this shot somewhere. To find it, start with a dictionary.